CHICAGO — The idea of turning Chicago's alleys into main streets for art and commerce is inching toward reality thanks to a grant announced Monday from the Chicago Department of Cultural Affairs and Special Events. The concept, dubbed "Rebel Garages," was unveiled in June as part of the Chicago Architecture Foundation's "50 Designers, 50 Ideas, 50 Wards" exhibit. Architects Ann Lui and Craig Reschke, partners in the Bridgeport-based Future Firm, reimagined the city's alleys and garages as the home of artist studios and workshops, centers for community meetings and incubators for small businesses. 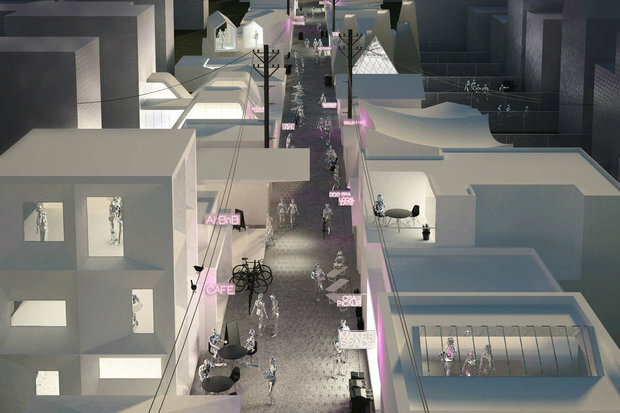 That vision will come to life in spring 2018, during a proposed one-day festival that "will enlist local architects, designers and artists to activate Chicago's alleyways, parking garages, empty lots and vacant industrial spaces with pop-up installations," according to a statement announcing the grant. Rebel Garages, to be overseen by the Chicago Architecture Foundation, was one of eight recipients of funding via the city's IncentOvate program, which supports projects that create new arts experiences across Chicago. The grant money will be used toward the event's planning, including site analysis.